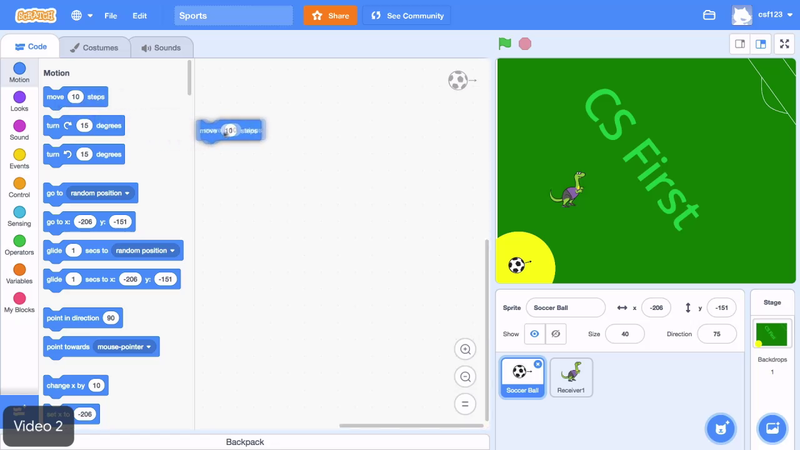 In this video, you will program the ball sprite to move when the spacebar is pressed. First, click on the ball sprite. From the motion menu, drag out the move ten steps block. Next, program the ball to repeat moving until it touches the edge of the stage. From the control menu, place a repeat until loop around the move ten steps block. In the repeat until block, there's a space to tell the blocks inside it when to stop repeating. In this case, the block should stop repeating when they sense that the ball sprite is touching the edge of the stage. From a sensing menu, drag out the touching block and place it inside the repeat until block. Click the drop down and select edge. The ball sprite should move until it touches the edge of the screen then stop, and it does. To make the sprite return to its starting location every time the code is run, you'll use a go to XY block. First, though, drag the sprite to its starting position. The values in the go to XY block will automatically update in the menu based on the sprite's position. Then drag the go to XY block above the repeat loop. The sprite moves until it touches the edge of the stage. It begins in its starting location, then moves until it touches the edge of the screen. To make this keep happening for the entire game, place a forever loop from the control menu around the code. Click on the code again. The ball sprite goes to its start location, then moves to the edge of the screen, then returns to its start location over and over and over again. Next control when the ball sprite starts moving so that it doesn't keep looping uncontrollably. First, click the stop sign. To make the ball move only when it senses that the spacebar has been pressed, go to the control menu. Choose an if block and place it around the repeat until loop under the go to block. Then go to the sensing menu and place a key press block inside the if. Click the drop down and select spacebar. Now the code reads, forever go to the starting location. If the spacebar is pressed, repeat moving until touching the edge. Once touching the edge, run the loop again and return to the starting location. Test the code by clicking on it, then pressing the spacebar. Make the ball sprite move until it touches the edge of the screen using move, repeat until, and touching edge blocks. Give the ball sprite a starting location using the go to block. Make the ball sprite repeat these actions using a forever block. And finally, make the ball sprite move only if the user presses the spacebar with if and key pressed blocks. In the next video, you will learn how to control the ball sprites direction.